Every organization has a culture and a set of values. Wayland’s values were embodied nearly 50 years ago, displayed proudly for all to see, on the wall of the then-new Middle School. Henry David Thoreau, Rachel Carson and Martin Luther King Jr. represent what we consider as a town to be really important. Two of those three images focus our commitment to protect the environment. And for decades after they were painted Wayland was an environmental superstar. We backed a strong Conservation Commission, nurtured the Sudbury Valley Trustees, and provided volunteers and financial support for regional environmental groups. We partnered with those groups and federal agencies to protect a large fraction of the town as conservation land, and by unanimous Town Meeting vote supported the national recognition of the Sudbury as a Wild and Scenic River. But around the turn of this century things seemed to change. Development interests gained power. A new generation entered town with a focus only on the schools, not realizing that the beautiful green space they took for granted had taken great effort to preserve. That led to the creation of the failed Town Center shopping mall. And carpeting a large swath of land virtually on top of our best drinking water wells with plastic – the High School turf field. Canadian Prime Minister Justin Trudeau is using Canada’s presidency of the G7 “to help stop the oceans from becoming massive rubbish heaps,” “particularly around plastics,” says a CTV report. At the same time, Norway’s environment minister is proposing rules to address plastic pollution from artificial turf, recognizing it as an important source of microplastic emissions in Norway. Wayland High School’s artificial turf field, installed in 2007, is wearing out. What does wearing out mean? It means the vinyl or polyethylene plastic strands simulating grass are being broken down by UV sunlight and abrasion from players’ shoes into small pieces and microparticles, and then being blown or washed away. Where does that plastic go? Into the marsh, and then the river. And ultimately, the ocean. The same will happen to any replacement artificial field, no matter what is chosen as the infill propping those plastic strands up. There is a huge debate over whether the toxin-laden ground up tires commonly used as infill (including in Wayland’s field) actually release those toxins to poison players and the environment. And there are suggestions the problem can be solved with alternative infills, including pricey virgin rubber and coconut husks. But even if those alternatives are an improvement over old tires, they don’t solve the problem of the plastic that will eventually pollute the river behind the high school and the marshes around the Willowbrook neighborhood if the Recreation Commission has its way and a new artificial field is built at the Loker site on Rte. 30. Ironically, taxpayers are being asked to spend millions of dollars more than otherwise necessary to renovate the high school facilities to protect the wells and the river. “A significant driver in the design of the athletic improvement plan is rooted in the effort to enhance the protection of both the Happy Hollow Wells as well as the Sudbury River Watershed,” says the Annual Town Meeting Warrant. In 2006 and 2007, the Boosters and the Board of Selectmen, the proponents of the then-proposed new artificial turf field, maintained adamantly that the field would be harmless to the wells. Concerns that town drinking water might filter through the huge bed of ground-up old tires on the way to our taps were dismissed as mere speculation. But in 2010, after the field was built, hydrogeological testing confirmed that under normal conditions about a third of the field drained to the wells. Under drought conditions that portion would increase. The testing to determine whether that drainage contained toxins, agreed to by the selectmen and Boosters as a condition of the final permit to build the field, was never done. Several years ago, however, the Board of Public Works hired an environmental consulting engineer to check out the field. She found that the drainage system under the field designed by Gale Associates (the same firm that provided the study on which field usage claims are made to justify the need for artificial turf fields) didn’t work. And that there were masses of matted plastic strands in the swale to the north of the field. Again, that plastic pollution is independent of the tire shreds or groundwater drainage. In fact, much of the plastic is probably being blown off, rather than washed off, and is thus impossible to stop or contain. There is a much cheaper and better way to protect the wells and the river. In 2011, DEP approved a Wellhead Protection Plan, the culmination of four years of effort by the Wayland Wellhead Protection Committee, which recommended that when the turf field wore out it be replaced by a grass field. Doing so would be far more effective in protecting the wells and river than all of the rebuilding and shifting being proposed. It would also save millions of dollars. The soil under grass is what prevents contaminants, whether from humans or animals, from getting into the groundwater and to wells. The microbes in soil break down pathogens and chemicals, and trap other pollutants. And they work for cheap. Ultimately voters at the ballot box and at Town Meeting will have to decide – what’s more important, pure drinking water and the environment, or more sports? Tom Sciacca was a member of the Wellhead Protection Committee. Recycled rubber artificial turf and similar products were introduced into athletic fields and playgrounds in the 1990s to make playing surfaces more comfortable. This recycled rubber comes from automobile tires, which are ground into very small rubber pellets, called crumb. Scientists and doctors have expressed concern about crumb rubber use in play grounds and artificial turf because safety testing of these products has not been conducted, and tires are known to contain heavy metals, cancer-causing chemicals, and other toxic substances. Children can be exposed to the harmful substances in crumb rubber when the pellets touch their skin, when small pieces are accidentally swallowed, and when some of the chemicals are released from the rubber in the form of gas which can be inhaled, or enter the environment through leaching. In this podcast, learn more about what scientists are doing to understand the health risks of crumb rubber in playgrounds, and what you can do to reduce children’s exposure to potentially harmful contaminants. Interviewees: Robert Wright, M.D. and Homero Harari, Sc.D. Robert Wright, M.D., is a pediatrician and environmental epidemiologist at the Ichan School of Medicine at Mount Sinai. He serves as the chair of the Department of Environmental Medicine and Public Health as well as the director of the Institute of Exposomic Research, and the Children’s Environmental Health Center. Wright wrote a Perspective on Recycled Rubber Playing Surfaces, where he and co-author Sara Evans, Ph.D., discussed the significant gaps in knowledge about the safety of crumb rubber playing surfaces. Several potential dangers discussed (and outlined in the Consumer Guide developed by Wright and colleagues), include impacts from extreme heat, inhalation and ingestion of chemicals in rubber, small rubber pieces that can be tracked into homes, and chemicals leaching into groundwater. Wright is a co-investigator on a project working with Homero Harari, Sc.D., Evans, and Maida Galvez, M.D. to characterize exposure to crumb rubber used in artificial turf fields. Wright has published over 200 research studies, mainly focusing on environmental factors, such as exposures to chemical mixtures, that influence children’s health and neurodevelopment. Homero Harari, Sc.D., is an assistant professor in the Department of Environmental Medicine and Public Health, and member of the Pediatric Environmental Health Specialty Unit in the Department of Preventive Medicine at Mount Sinai. Harari’s research focuses on understanding the chemical exposure effects of turf and crumb rubber on child health and development. Harari is the lead investigator on the research study with Wright that is working to characterize exposure to crumb rubber used in artificial turf fields. This project involves community input to help identify research questions that are of particular interest. Learn more about crumb rubber on Toxipedia. See the Factsheet on artificial turf and children’s health developed by Mount Sinai. Read more on the New York Health Departments Factsheet on crumb rubber. 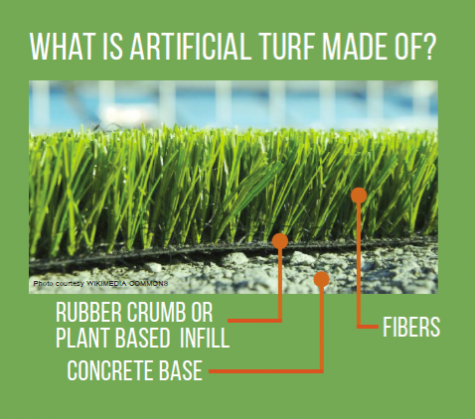 Check out the Consumer Guide on crumb rubber and artificial turf for more information and recommendations from the Mouth Sinai Children’s Environmental Health center. Read more about Federal Research on recycled tire crumb rubber used on athletic playing fields. Check out the Crumb Rubber Information Center from the Consumer Product Safety Commission. Read the Perspective on Recycled Rubber Playing Surfaces written by Wright and Evans. Danger on our turf: is MCPS protecting athletes? In 2008, MCPS installed their first turf field at Richard Montgomery High School. Their contractor told them they were getting “breakthrough” technology and touted “unmatched durability” against wear—the “safest system you can buy,” as described in company sales pitches. Now, 10 years later, FieldTurf—the company that installed all six Montgomery County high school turf fields—is the target of a federal class-action suit brought by organizations in 46 states and the District of Columbia, alleging the company knowingly sold “inherently and materially defective” fields. A major player in the international turf industry, FieldTurf has been forced to replace one MCPS high school’s field three years ahead of schedule “to assure the safety of athletes,” because the carpet on the field was “deteriorated” and “heavily worn,” according to a January 2017 Montgomery Parks department press release. FieldTurf, for its part, stands by the safety of its fields. “Every single field in Montgomery County is proven the safest possible field in existence,” FieldTurf regional sales representative John McShane said in a phone interview Feb. 28. Over the past decade, MCPS has replaced some of its grass fields with artificial turf because it offers increased field-time and durability, MCPS athletic director Jeffrey Sullivan said. Graphic by Ann Morgan Jacobi. Whitman, along with Einstein High School and Julius West Middle School, is in line to get a turf field this summer. The Montgomery County Council approved $4.9 million to fund construction of the fields; Montgomery Soccer Inc. agreed to cover $4.2 million of the cost in exchange for 1,000 hours of field time per year over a 10-year period. The Whitman All-Sports Booster Club will contribute an additional $300,000 to the school’s project. FieldTurf is among the bidders in the district’s open bid process, McShane confirmed. Meanwhile, tests at two of the current turf fields have revealed spots that at times have been worn to the point of being deemed unsafe for athletic competition, per MCPS and industry standards. Continued use of the fields has raised concerns over the validity of MCPS’s testing protocol and whether MCPS is doing enough to ensure the safety of athletes. In 2005, FieldTurf started selling fields made of Duraspine fiber, which they marketed as a breakthrough product that would last at least 10 years, according to sales pitches cited in the class-action suit. FieldTurf sold at least 1,450 Duraspine fields all over the country between 2005–12, the lawsuit states, including the field at Montgomery Blair High School. Two other MCPS fields—at Richard Montgomery and Walter Johnson High Schools—are made of FieldTurf Duraspine fiber as well. FieldTurf stopped selling the Duraspine fields in 2012 after complaints over the durability of the fields, according to the lawsuit. The class-action lawsuit against FieldTurf came in the wake of national criticism following a 2016 investigative series titled “The 100-Yard Deception,” written by NJ Advance Media, a content provider for newspapers across New Jersey and Pennsylvania. The piece alleged that FieldTurf knew about the defects with the Duraspine fiber but continued to sell the fields anyway. FieldTurf denied the allegations in the NJ Advance Media story, saying that concerns with Duraspine never compromised field safety and only affected some fields. Turf at Walter Johnson, a field installed with Duraspine technology. Photo by Ann Morgan Jacobi. “There is not and has never been any issue with the safety of these fields for playing on,” FieldTurf CEO Eric Daliere wrote in an open letter late 2016. In 2011, the company sued their supplier for defects in the manufacture of the Duraspine fiber. Daliere said in the open letter that the defects only affected “how a field looks over time in certain UV environments,” particularly in the Southern and Southwestern regions. However, many organizations that have joined the national suit against FieldTurf—including Montgomery Parks—are not located in high UV environments. From the sale of these Duraspine fields, FieldTurf made an estimated revenue of $570 million, mostly at the expense of taxpayers, NJ Advance Media reported. Blair was forced to replace their Duraspine field, owned and overseen by Montgomery Parks, three years earlier than expected after it failed a safety test midway through the fall sports season in October 2016. The field was still under warranty, Parks director Michael Riley wrote in a letter April 5, 2017, though it wasn’t clear at the time how much—if any—the company would pay for the “approximately $725,000” replacement. A Jan. 27, 2018, NBC4 report cites an unnamed “official” as saying the replacement was billed to taxpayers, but The Black & White was unable to verify this report. Montgomery Parks joined the class-action lawsuit against FieldTurf in January 2018. MCPS, which owns all other turf fields and will own Whitman’s, is currently monitoring the conditions of its fields and will join the lawsuit if it becomes necessary, MCPS spokesman Derek Turner said in a phone interview Feb. 28. 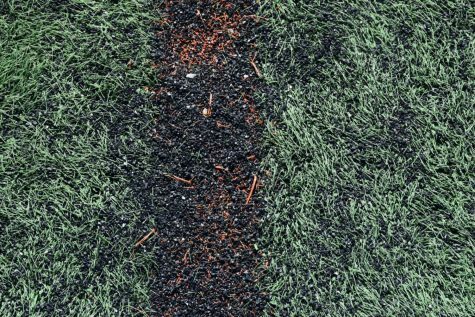 Athletes say the fields at Richard Montgomery and Walter Johnson have more visible patches of exposed crumb rubber pellets than other turf fields. The suit against FieldTurf alleges that Duraspine fibers shed from the field during normal use, meaning they hold infill less effectively, as can be seen by these exposed patches. Infill is more easily moved around and off the field, compromising the safety of the turf. Tests at the Richard Montgomery and Walter Johnson fields have revealed both to be potentially dangerous to MCPS athletes per industry standards. Still, MCPS continues to allow athletic competition on the fields, leading some experts to question their testing procedure and standards for turf safety. One important measure of turf field safety is the GMAX level test, which measures shock absorption and intensity of impact when an athlete falls on the field. The higher the GMAX level is, the less shock the surface absorbs and the more dangerous the field is for athletes—specifically in terms of knee and head injuries. Turf infill is intended to soften the playing surface, cushioning the concrete base underneath. When the field is used, the pellets are displaced from high traffic areas and the GMAX levels there increase as the layer of shock absorption between player and concrete is thinned. GMAX levels above 200 can be life threatening if a player hits their head on the field, according to Penn State’s Center for Sports Surface Research. The Synthetic Turf Council, an industry trade association, recommends a standard maximum of 165, which is also used by the NFL and Fairfax County. For reference, the average natural grass field has an equivalent GMAX rating of 90, Maryland SoccerPlex states on its website. Yet the MCPS standard for GMAX is anything below 200. In October 2016, Athletic Field Consultants, Inc., a company subcontracted by FieldTurf, tested Blair’s field during a mandated biannual test. 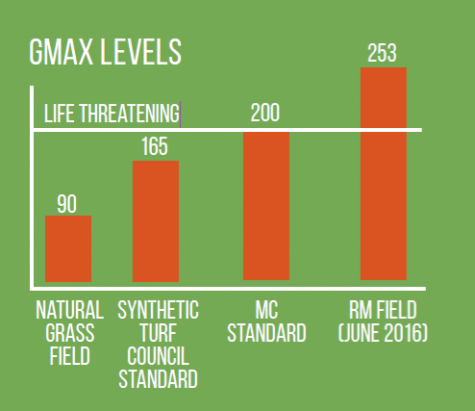 GMAX levels on the field measured over 200 in multiple areas, a report published by the Montgomery County Parents Coalition revealed. Initial repairs were made before play resumed, and the field was replaced in 2017. However, it’s likely that students played on the field while the levels were still unsafe: the Blair Blazers had played a home football game just three days before the test. — Gaston de los Reyes Jr.
MCPS doesn’t own the Blair field, but its fields suffer similar issues. Tests in the summer of 2016 on the fields at Richard Montgomery and Walter Johnson revealed that both had average GMAX ratings around 180 with multiple spots at Richard Montgomery registering well over 200, according to reports by the companies FieldTurf contracted to test the fields. One spot at RM registered over 250—significantly higher than the threshold for life-threatening. This information was first published in an Aug. 16, 2016, Forbes article and a Nov. 2, 2016, Bethesda Magazine article. Instead of immediately replacing the fields like Montgomery Parks did at Blair, MCPS waited to have the fields retested. The turf tester noted in his report that maintenance crews added rubber infill to high-use areas and groomed the fields immediately prior to tests. Resulting average GMAX levels dropped close to 30 points at each site. Though he has not been involved in MCPS fields, de los Reyes expressed concern about this testing method. While this process can lower GMAX levels temporarily, if a field has GMAX levels in the 250s in some areas, like Richard Montgomery had in 2016, simply adding infill can’t bring down those levels for any length of time, said Buzz Splittgerber, owner of Idaho-based turf testing company BuzzTurf. Especially on a high-use high school field, the infill is going to get moved around very quickly, creating an inconsistent surface, he said. “I’ve never seen a case like that, and I’ve tested a lot of fields. When it gets to be that high [then] the turf is worn out, so the infill material itself just doesn’t stay in,” Splittgerber said in a phone interview. Splittgerber has not tested any Montgomery County fields. Ryan Teeter, who administered the June 2016 test of the Richard Montgomery field, corroborated this view in an interview that year with Bethesda Magazine. Teeter said in the interview that the grass fibers are responsible for holding the crumb rubber infill in place, and if the fibers fail, which Teeter said they had, the field can quickly deteriorate. In any case, both Duraspine MCPS fields are dangerously close to—if not over—even the weakest of standards. For MCPS athletes, what happens next? MCPS will install a turf field at Whitman in the near future. Installation is planned to start immediately after the spring sports season, county athletic director Sullivan said. FieldTurf has submitted a bid for the field, sales representative McShane confirmed. FieldTurf no longer uses Duraspine technology. Asked if FieldTurf remains a serious contender for the new contract, MCPS spokesman Turner replied: “MCPS has a formal bid process for fields where any qualifying vendors can submit their bids. No announcement has been made about who will receive the contract at this time.” MCPS has offered no public indication of concern over FieldTurf itself and has not yet followed Montgomery Parks in joining the class-action lawsuit against the company. “FieldTurf has installed a lot of successful fields across the country,” Sullivan said. The MCPS Board of Education has twice delayed awarding a contract for the three fields. In anticipation of the new turf field, Whitman’s Bermuda grass field never underwent its regular winter maintenance. Since the turf won’t be installed until summer, Whitman’s spring athletes will now be forced to play home games on the grass anyway. Sullivan said the field will be ready for play in time for the spring season. This summer, the Richard Montgomery field will have completed its 10th year of use, but Richard Montgomery athletic director Chamara Wijeratne said he wasn’t aware of any definite plan to replace it. The Walter Johnson field will have completed its eighth year. At present, MCPS has not allocated funds to replace either the Walter Johnson or the Richard Montgomery field. MCPS athletes will spend hundreds of hours playing on the two fields this spring. Given ongoing lawsuits, defective technology and weak testing standards, their safety is questionable at best. Tiger Björnlund and Sam Shiffman contributed to this report.